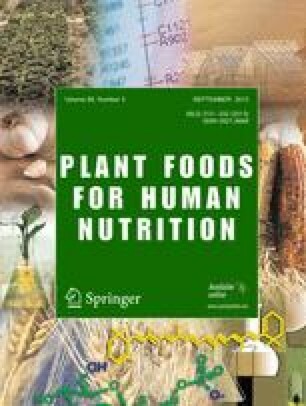 Six green leafy vegetables and herbs – spinach, amaranth, bengal gram, cauliflower, mint, coriander and carrots – were analyzed for moisture, protein,ascorbic acid, β-carotene, total iron, ionizable iron (as % of total iron) in vitro iron (% of total iron), copper, manganese and zinc. Moisture content of the leaves and carrots varied from 75.1 percent (bengal gram) to 95.4 percent (carrot) and protein from 9.83 percent (carrots) to 30.9 (mint) percent. Ascorbic acid, β-carotene, total iron and ionizable iron contents were at a maximum in case of bengal gram leaves whereas level of ionizable iron and in vitro iron as a percent of total iron was highest in carrots. Copper, manganese and zinc contents were maximum in spinach.